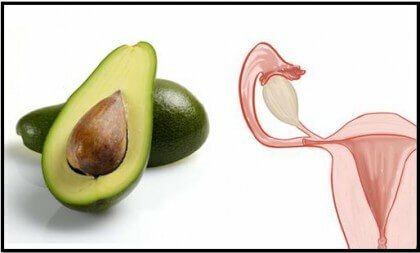 Did you know that avocados are shaped like the human uterus and take 9 months to mature? The same amount of time as a pregnancy? Have you ever wondered why there are some foods that resemble body parts? How about the claim that these foods are better for the parts of the body they resemble than for others? Today we’ll be exploring these special foods and theories about their supposed effectiveness. Most of us believe that nature is wise, but such obvious signals would be shocking indeed. Some people believe that nothing Mother Earth does is random or without reason. Everything, they claim, has a purpose, even though we may not be able to see at first glance. With these ideas in mind, let’s take a look at 11 of the most surprising foods that resemble body parts. Carrots are one of the best health foods. They can be especially important for your vision thanks to their high beta carotene content. They also contain significant amounts of vitamins A, C, B1, B2, B3, B6, B9, C, E, K and coline. Aside from vitamins, carrots have minerals like potassium, magnesium, iron, calcium and phosphorus. This makes the carrot one of the best health foods you can eat. These nutrients are especially important to vision health. As an example, Vitamin A deficiency causes night blindness. This vitamin also helps prevent cataracts and age-related macular degeneration. If you were to cut a carrot across the width, you’d see that the carrot is one of the foods that resemble body parts. You’d marvel at how the interior resembles the silhouette of a human eye. You’d notice how the lines resemble the pupil and iris. Be forewarned that although cooking carrots brings out their sweet flavor, it causes them to lose their antioxidants properties that are beneficial to the visual system. Carrots are mostly made up of carbohydrates. 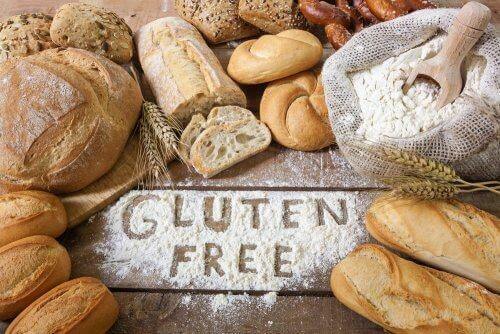 They’re a source of dietary fiber that doesn’t contain saturated fats or cholesterol. In addition, their low calorie content (40 calories per 3.5 ounce serving) makes them great for diets. As you can see in the image below, the strawberry is one of the foods that resemble body parts. 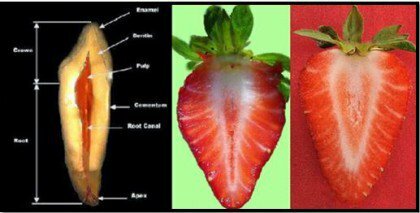 Looking at the interior of half a strawberry shows you that it’s really similar to the image of the same perspective on a tooth. On top of being a natural teeth whitener, strawberries promote strong, healthy, teeth. Some studies show that they may also promote the health of the gums and oral cavity. 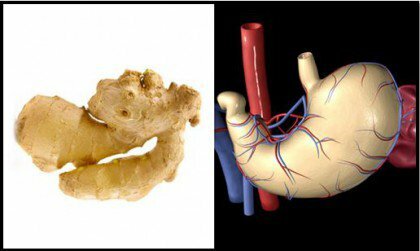 Another item at the top of the list of healthy foods, ginger has been used in Oriental medicine for centuries to calm upset stomachs. If you look closely, you’ll see that specimens of this food often have a similar shape to the stomach. 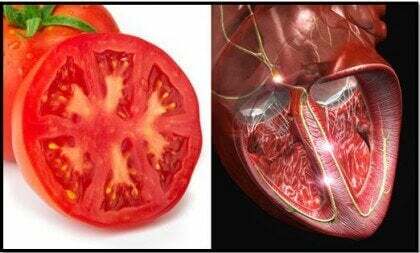 If you look at a tomato that’s been cut in half, you’ll notice that it has different compartments where the seeds are located. This distribution is strikingly similar to that of the heart. Tomatoes are one of the top health foods. They are rich in licopene, a vegetable pigment that protects the heart from cardiac disease and counteracts the negative effects of cholesterol. 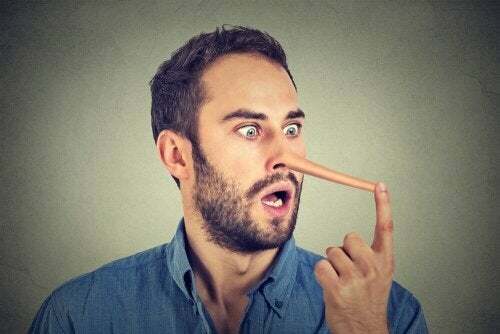 Curiously, there are other foods which lack the characteristic red color, yet contain licopene, like beans and parsley. The physical similarities between beans and the kidneys is obvious even at first glance. These legumes have a strong cleansing effect on this organ. In traditional Chinese medicine they’re used to improve and strengthen renal function. Oranges, lemons, limes and grapefruit bear an extraordinary resemblance to human breasts. They contain properties that promote the natural lymphatic drainage of the mammary glands. Some studies show that they may also inhibit the development of cancer cells in the breasts. Some people claim that figs increase libido and fertility in both sexes. In addition, this fruit contains large quantities of Vitamin B6, which is responsible for the secretion of serotonin, the happiness hormone. 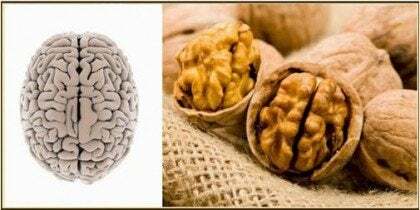 Nuts are great for the brain due to their high content of omega-3, omega-6, and omega-9 fatty acids. What’s truly surprising is that the folds, wrinkles, and even the shape of the shell look very much like the the cerebral layout of humans. Nuts maximize the development of neurotransmitters and help maintain the chemical balance in the brain. There are studies that support the fact that consuming nuts regularly helps fight issues like depression and dementia. Avocados contain folic acid, a substance that may be important to fertility. Consumption of folic acid reduces the risk of cervical dysplasia, a precancerous illness. Another interesting fact is that the avocado takes 9 months to mature from its flower state. This is the same amount of time it takes a human baby to grow in the mother’s womb. Celery has a bone-like appearance, so it’s fascinating that eating it may be good for bone strength. 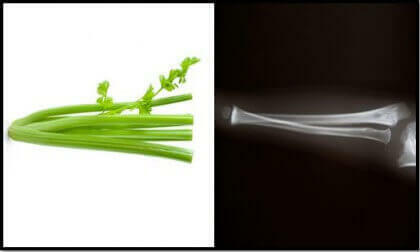 The radius and ulna of the arm are like long, slender stalks of celery. 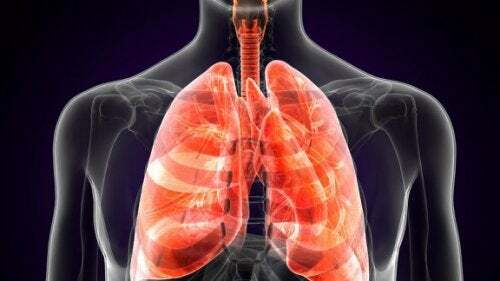 This food contains high concentrations of silica, which is important for strengthening the bones. In addition, it’s rich in calcium, another element necessary for our bones to stay healthy. Their striking similarities go even further: both bones and celery are composed of 23% sodium. 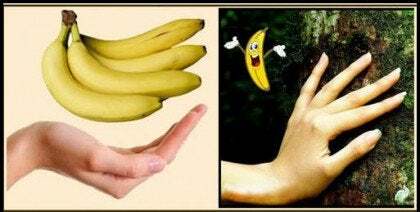 It’s well known that bananas are high in potassium, which is necessary for healthy joints. It also lowers your risk of suffering joint and muscular degeneration. Nature is truly amazing. Some people believe it sends us messages through the language of similarities. In this case, it’s in these foods that resemble body parts. This is a language we are only beginning to understand. It’s essential to learn to read it, because as we get closer to nature, we get closer to ourselves.